The BEST Waffle Recipes for EVERY MEAL! Who wouldn’t love a waffle for breakfast, lunch and dinner?? Sometimes Pinterest can inspire even the worst cooks. I don’t consider myself to be amazing when it comes to culinary arts. In fact, the reason why I browse Pinterest is for EASY recipes that taste AMAZING. I was absolutely inspired when I came across WAFFLE recipes. We’re not just talkin’ breakfast here folks! I was floored at just how many meals you can actually use a waffle iron for. I mean, who needs an oven?? Evidently, the waffle iron can do things I never thought possible! 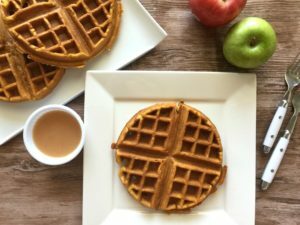 If you don’t have a waffle iron, I guarantee you might be adding one to your cart after browsing through these amazing recipes. This is just the cream of the crop too! If these recipes inspire you like they did me, just search waffle recipes on Pinterest and you’ll see there is no shortage of more ideas for this little countertop appliance. Pumpkin Spice Waffles with Apple Cider Syrup OH MY YUMMMM!!! So, if your family has been complaining (like mine) that your meals are getting a little boring, maybe it’s time to pull out that hot iron and make a little WAFFLE LOVE! Not only will you change your meals up, you might just make meal time a little easier and less time consuming too! What are the best waffle recipes you’ve tried?